This 'adults only' hotel is perfect for golfers looking for the highest level of comfort and service, in a location offering easy access to the golf courses West of Palma, Mallorca. 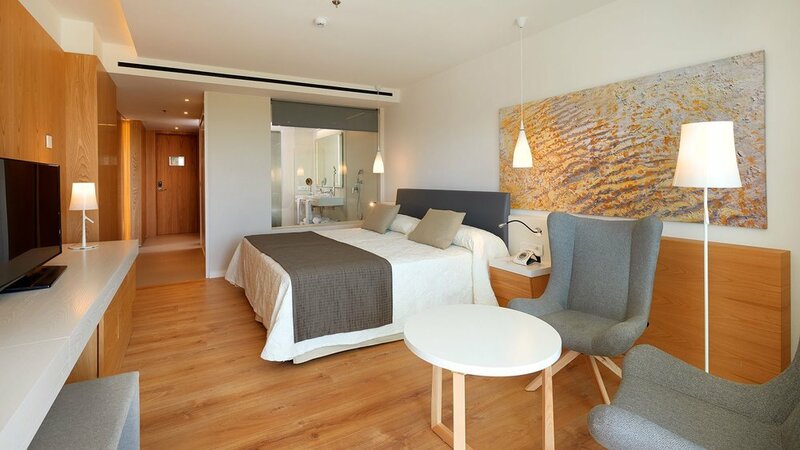 The 224 room, 5-star, Hipotels Playa de Palma Palace opened in Summer 2017. It’s stylishly finished with pale wooden floors, and complemented with cream furniture in the hotel's bars and lounges. Each of the hotel’s modern guest rooms feature an en-suite bathroom with shower, air conditioning/heating, flat-screen satellite TV, Wi-Fi access, hairdryer and a furnished balcony. A safe, minibar, telephone and room service are offered at an additional charge. Junior Suites with sea or pool views are also available. The hotel's free-form pool is surrounded by sun terraces, with sunbeds and parasols. The indoor spa, features an indoor pool (open from 1st October to 30th April), along with a sauna, solarium and an extensive range of treatments. There’s a well-equipped gym, and free Wi-Fi is available throughout the hotel. The buffet restaurant at the the Playa de Palma Palace, offers a wide range of Majorcan specialities, along with a choice of exclusively-developed dishes, and a weekly Gala Dinner. This 'adults only' hotel is perfect for golfers looking for the highest level of comfort and service. As we mentioned with the sister hotel, the Hipotels Gran Playa de Palma, the resort of Playa de Palma caters mainly to German travellers, so you'd be unlikely to find a local bar showing UK sports. However, bearing in mind the quality of this hotel, you may decide not to explore locally. Portixol and Palma with their superb choice of bars and restaurants are both only a short taxi ride away.